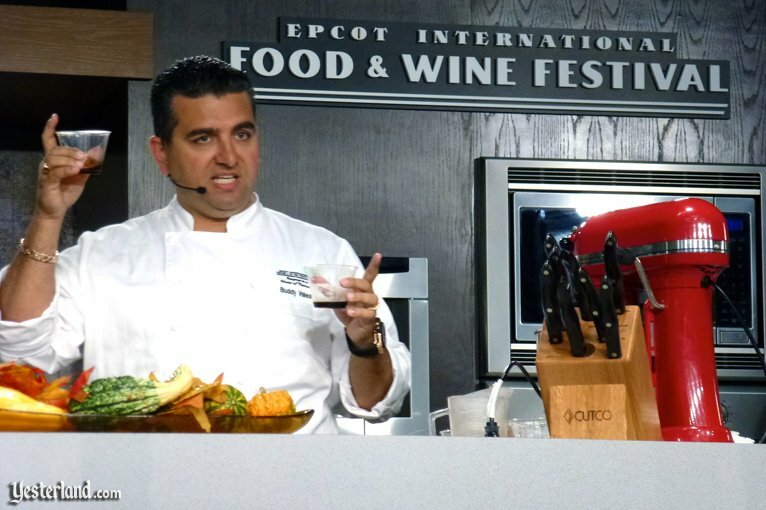 Saturdays are the biggest days at the Epcot International Food & Wine Festival. October 1, 2011, the Festival’s first Saturday this year, had spectacularly beautiful weather. But one week later, on October 8, it rained all day. Plenty of guests went to the festival anyway. Today’s photo essay lets you experience the Festival in the rain, while staying dry in front of your computer screen. 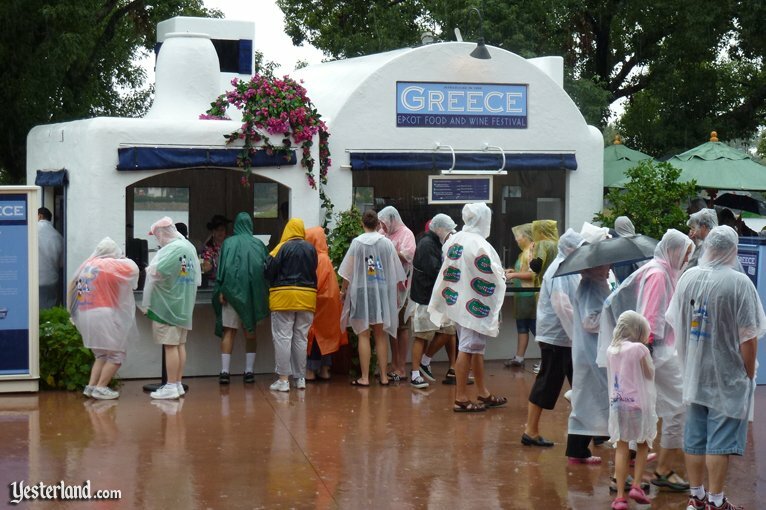 To see sunnier photos of the Festival, take a look at my opening day article about the 2011 Epcot International Food & Wine Festival. 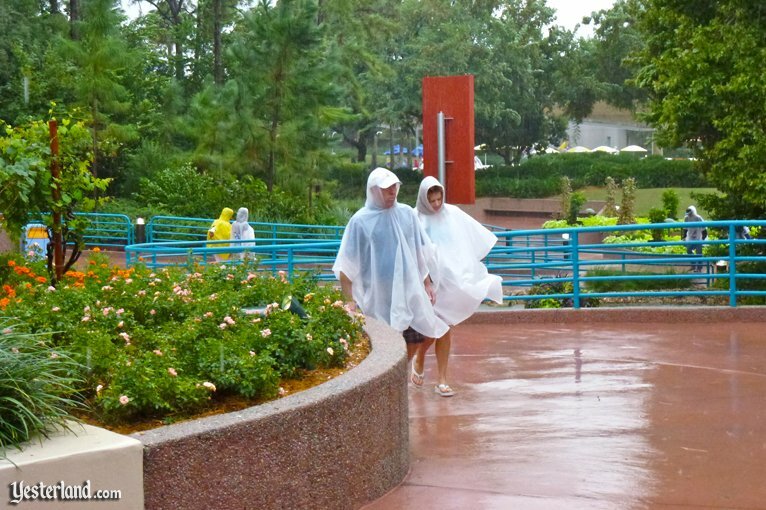 On Saturday, October 8, the event could have been called the Epcot Umbrella & Poncho Festival—or perhaps the Epcot Soggy Food & Rainwater Cocktail Festival. Of course, attendance was lighter than on a Saturday with perfect weather. But there were still many guests doing their best to enjoy the array of foods and beverages available in the outdoor setting. 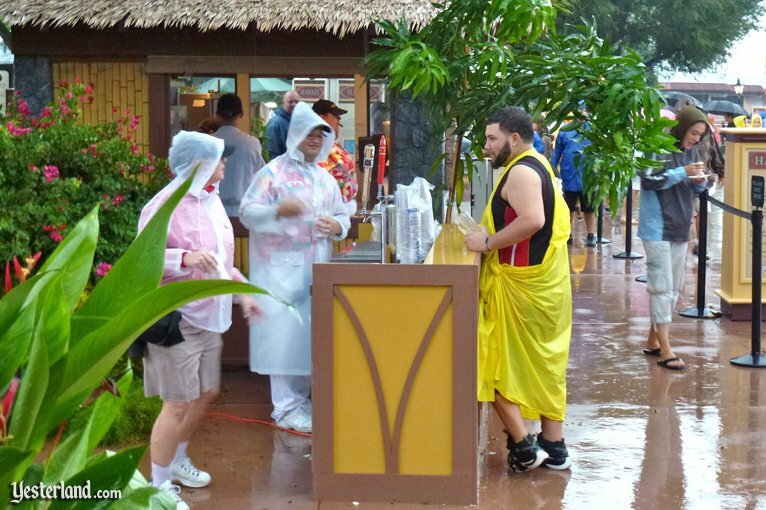 Some guests used their personal umbrellas well—despite the challenge of then using their remaining hand to carry food and beverages and to eat and drink. 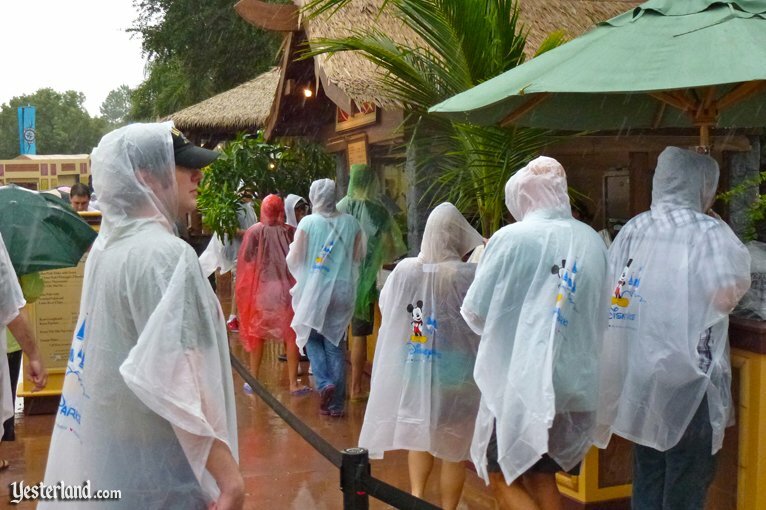 Other guests did their best to keep the rain off their purchases with their hands, as they scurried off to protected areas. Then there were those who ate quickly under the open sky, before their food portions were sitting in too much rainwater. 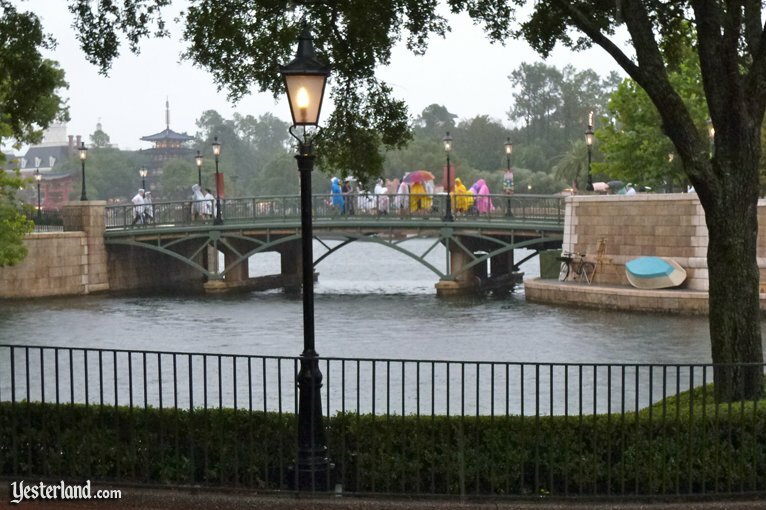 And some guests just seemed to ignore the rain entirely. New and reused ponchos were the fashion of the day. It was a good Saturday to get the Lobster and Scallop Fishermans Pie at Ireland. 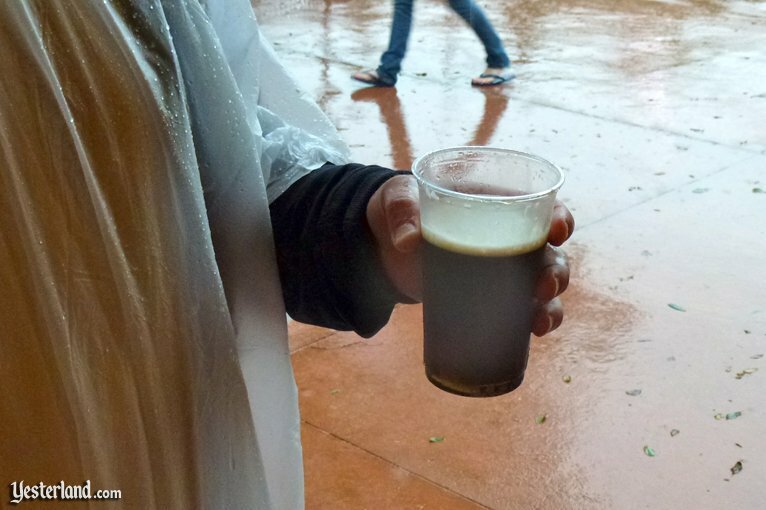 Despite Disneys effort to make the Ireland International Marketplace a high-capacity operation, there can be a long line for this Festival favorite when the weather is good. 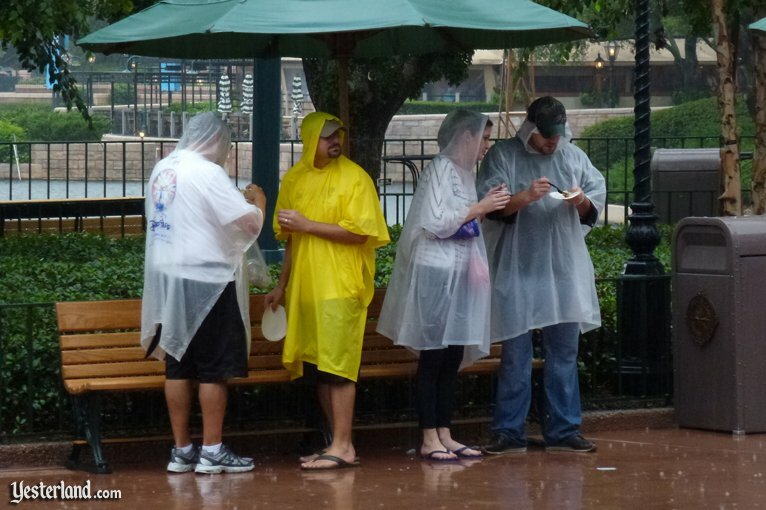 Epcot Cast Members sporting frosted clear plastic ponchos worked at point-of-sale equipment covered with plastic—essentially ponchos for cash registers. At most International Marketplaces, lines were short or nonexistent. But that wasnt always the case. 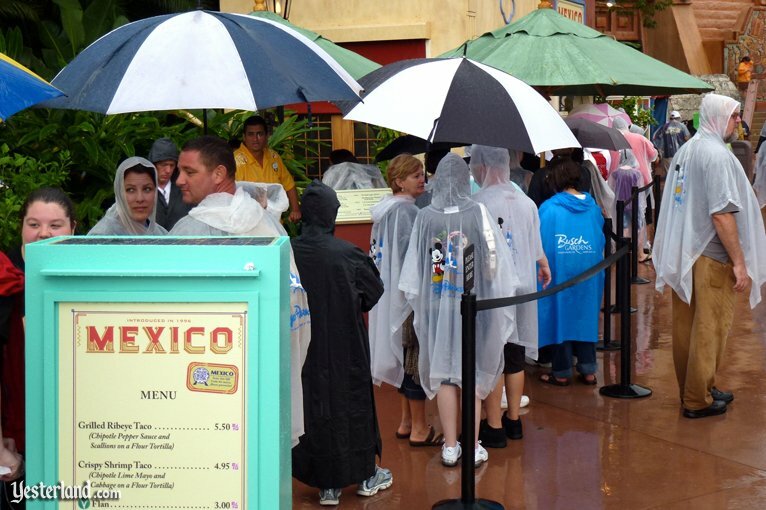 The foods at Mexico are always Festival favorites—rain or shine. 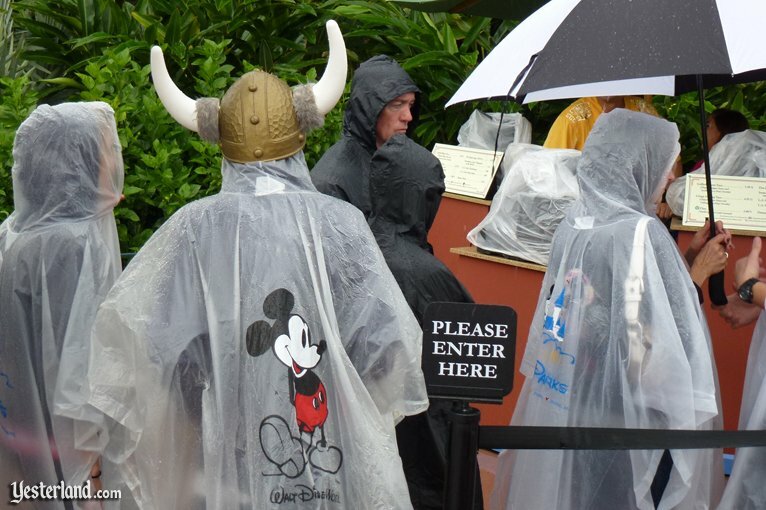 Vikings arent afraid of the rain! You have to hand to Disney. 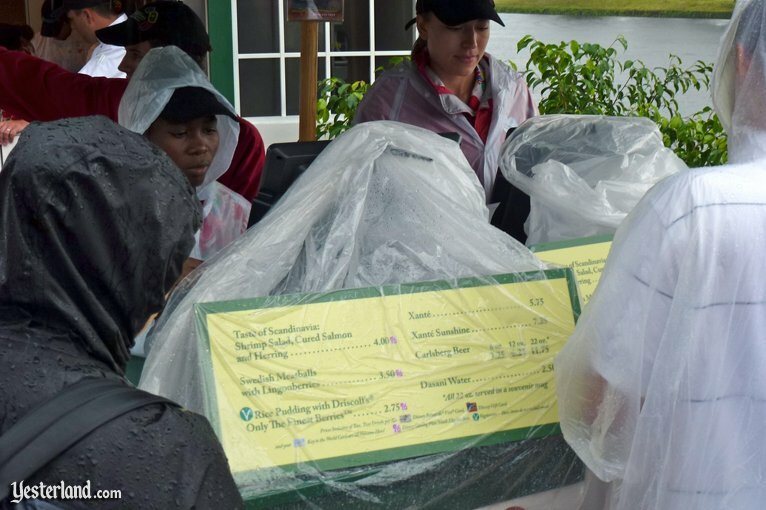 The fact that there are plenty of people willing to stand in the rain for the opportunity to spend money on tasting-size portions of food and wine—or somewhat pricey beer available in several sizes—is a testament to how much they enjoy the Epcot Food & Wine Festival. 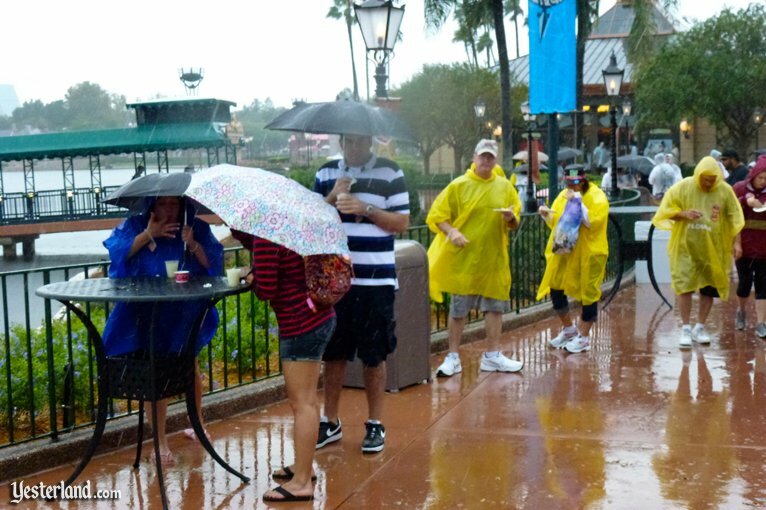 Or maybe the guests wondering around World Showcase in the rain were just people who spent hundreds of dollars per day for Disney resort rooms and multi-day tickets and now didnt want to stay in their resort rooms watching Walt Disney World: Top 7 Must Sees over and over. There was also a way to enjoy the Food & WIne Festival on the rainy Saturday in a dry, climate-controlled environment. Inside the Festival Center—the former Wonders of Life pavilion—guests could enjoy relatively inexpensive culinary demonstrations and beverage seminars, as well as free HGTV Seminars and Authentic Taste seminars. Epcots World Showcase can be quite beautiful when theres a cool rain. It feels completely different than on a hot, sunny Florida day—more serene. The international pavilions emerge from the mist as you walk around the Promenade. But I still prefer 75 degrees and sunny. 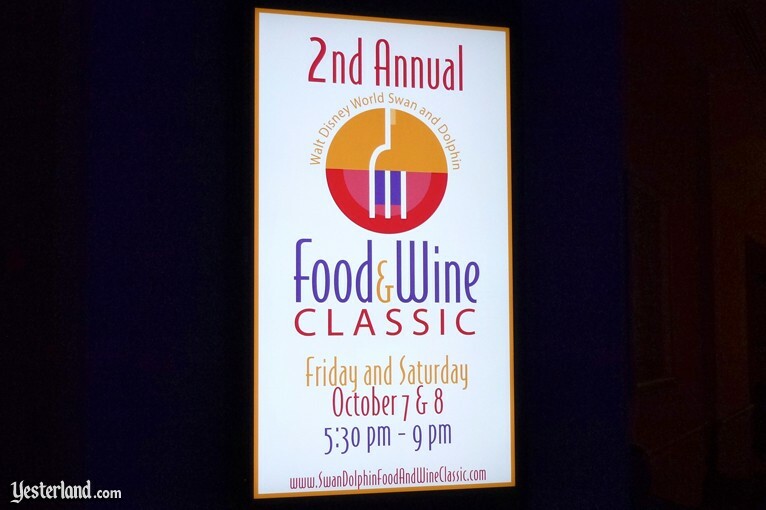 The Walt Disney World Swan and Dolphin Resort held its second Food & Wine Classic on Friday and Saturday, October 7 and 8. Its not part of Disneys Epcot International Food & Wine Festival, but the timing during the Festival is clearly not a coincidence. 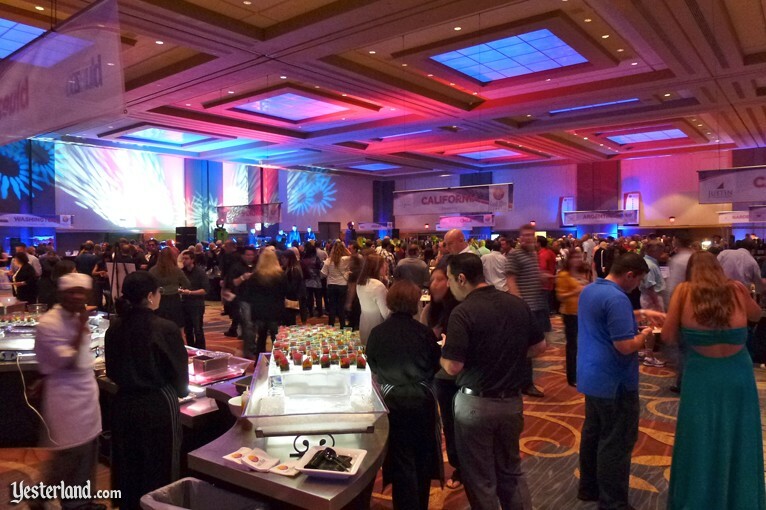 The main event both days was the Causeway Event, with plans for 21 beverage stations and 10 food stations open from 5:30 p.m. until 9:00 p.m. along the outdoor concourse between the two resorts and adjacent to the Swans swimming pool. On Friday, it began raining during the Causeway Event—ruining the end of the event. On Saturday, with a forecast for rain the entire day, the Causeway Event moved into the Swan Ballroom and the hallways adjacent to it. Guests who experienced the event both outside and inside commented that they preferred the indoor version. 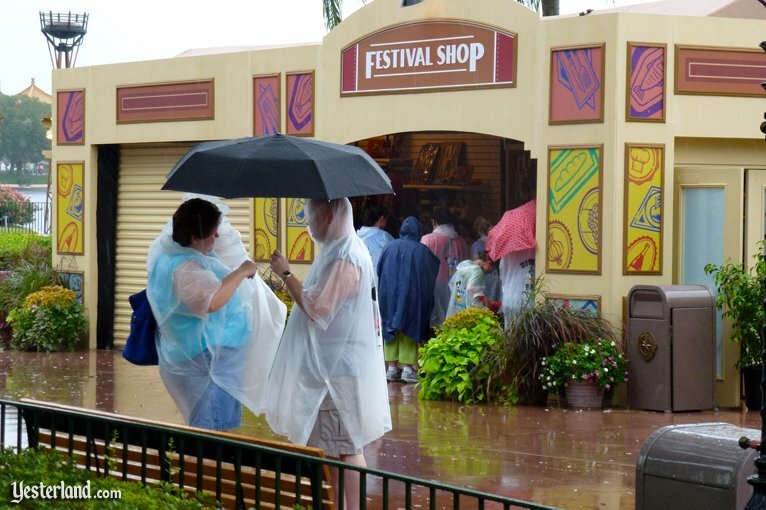 Perhaps it will rain again next year, and returning guests will get their wish to have Food & Wine Classic inside again. Given the unpredictable outdoor climate of Orlando in October, maybe the resort should just block out the Swan Ballroom now for 2012—and hold the event there in any case. 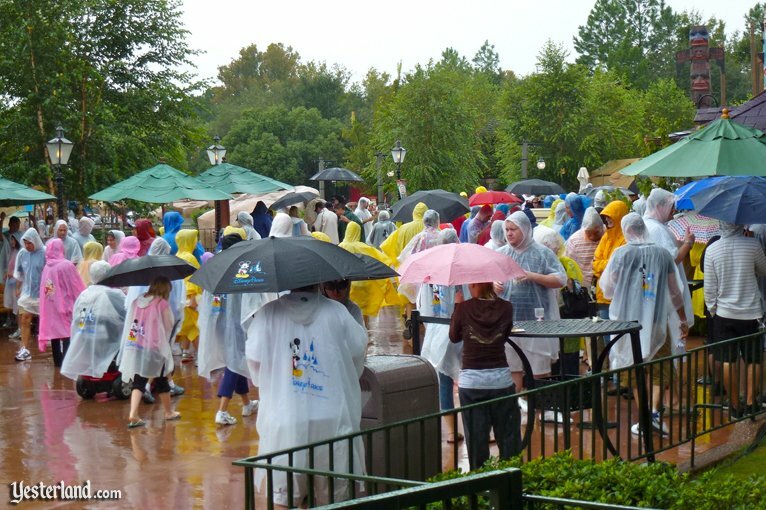 Whatever happened to the yellow ponchos with Mickey Mouse on the back? 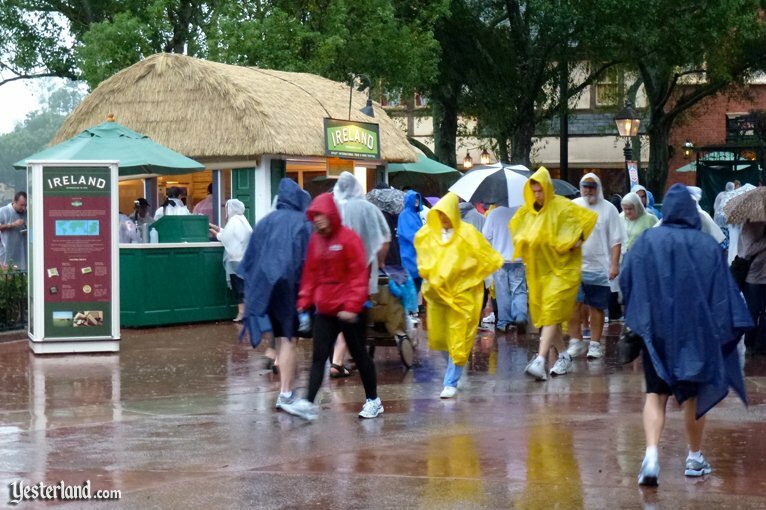 Take another look at Yellow Ponchos at Yester World. All photos in this article by Werner Weiss, October 24, 2011.